Some of the kombucha that we have accumulated over the weeks. We will have to rethink the quantity that we brew some time soon unless we want to start drinking almost a liter a day, which is effectively what we brew for. It wouldn’t be too healthy drinking that much… Especially not for the teeth. 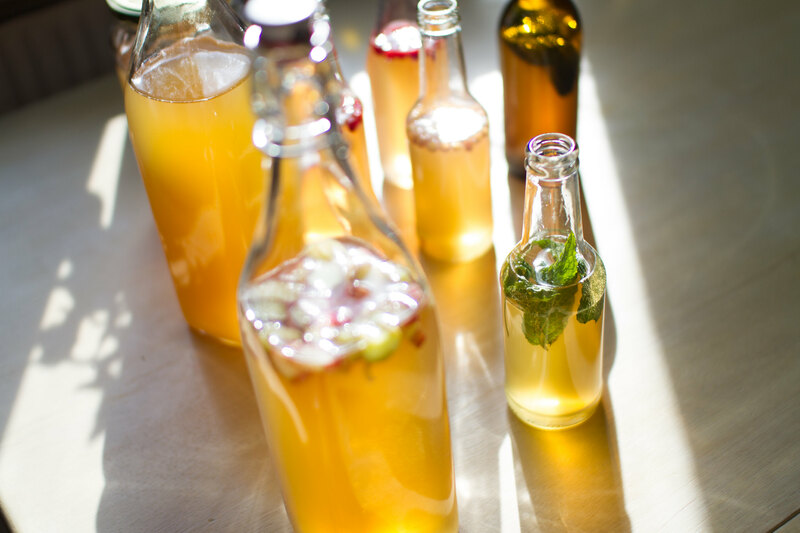 All the bottles of our wonderful kombucha. 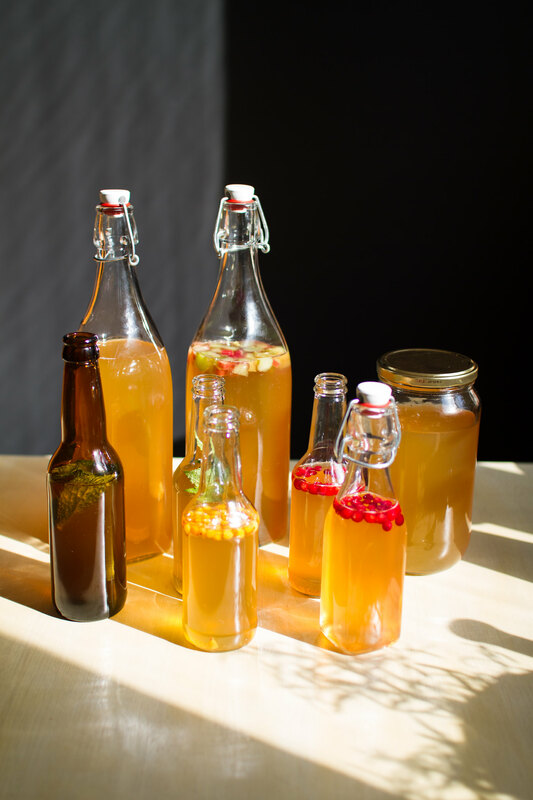 It was nine days since we started brewing the latest batch of kombucha, so about time to bottle it for the second fermentation and some flavouring. The newly bottled batch with flavours of sea buckthorn, lingon berries and rhubarbs. We haven’t tried many new flavourings for a while now, sorry about that, and this time we went with our old favourites, sea buckthorn, lingon berry and rhubarb. We really like fresh ginger and turmeric as well, but unfortunately we had none of that at home yesterday. 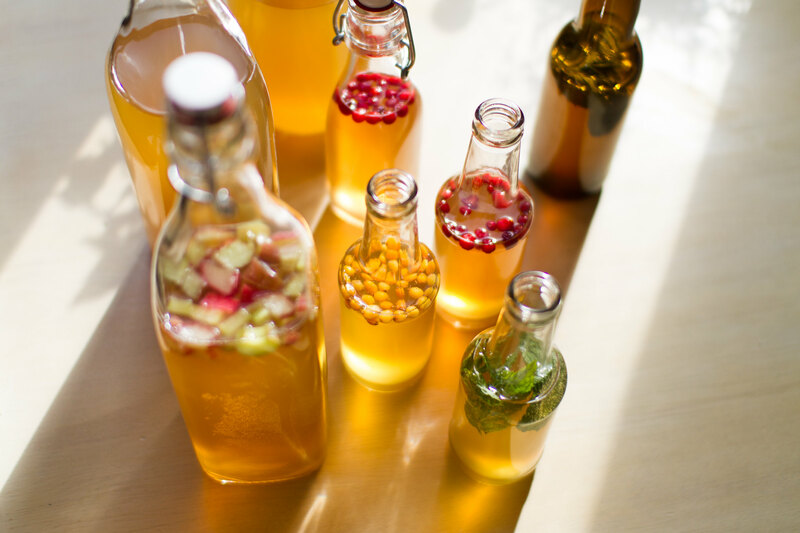 The bottles with berries and rhubarb. Ready to be filled with fresh kombucha. Since getting the noggin with the tap we have started to pour over from the other noggin to that as well, when bottling. 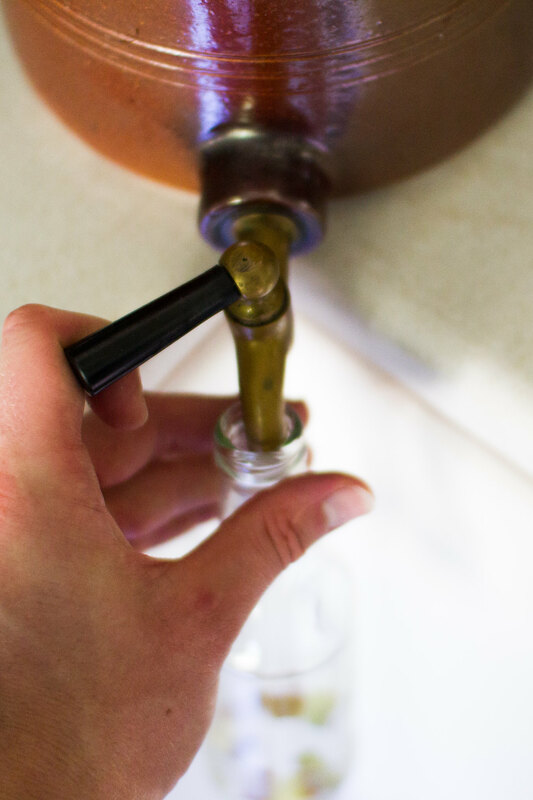 So much easier than trying to pour straight into the bottles. 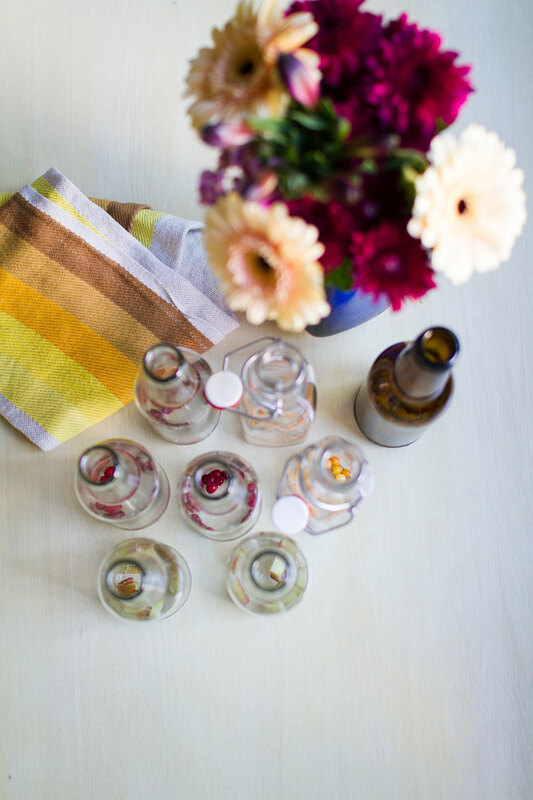 Turn the tap and watch the fresh kombucha fill the bottles. For the past few months since we started scaling up we have brewed both our large noggins every ten days. 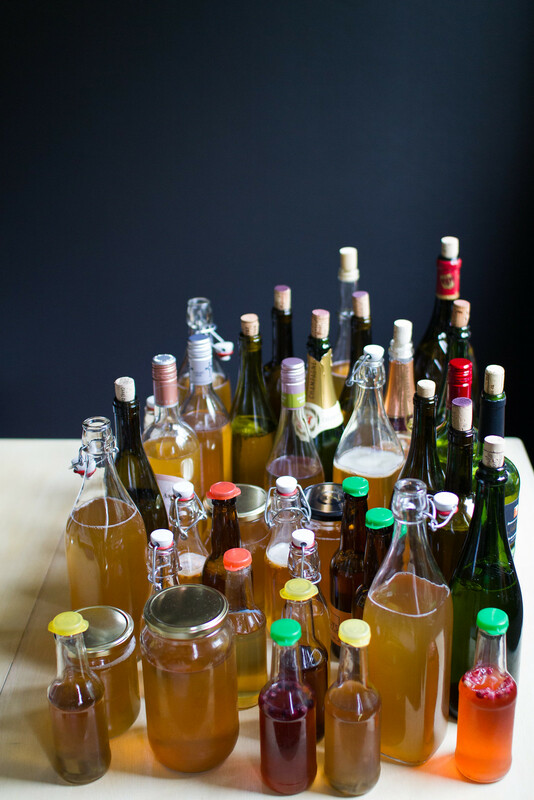 That results in almost eight liters of bottled kombucha which is way more than we consume. 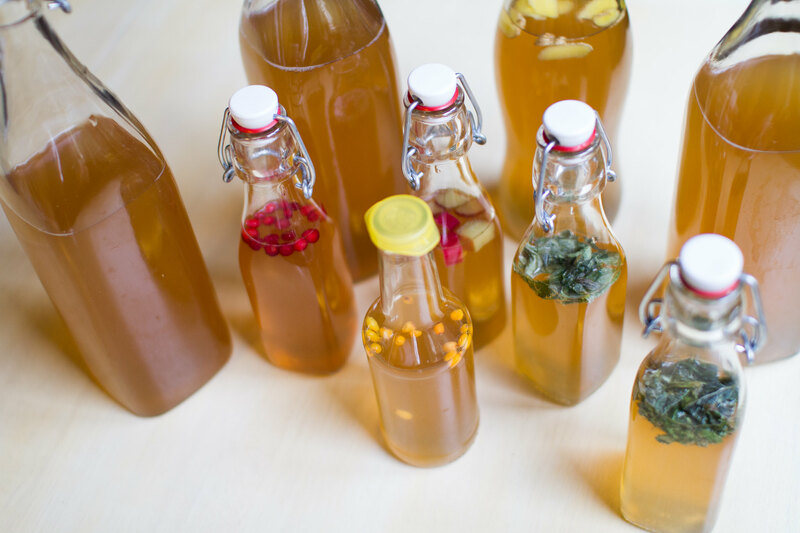 So we will have to change that soon, unless we want to have our whole kitchen filled with kombucha bottles. We are already getting there. For some reason it is not very nice to have like a liter of kombucha each for each meal, that just takes away the pleasure of it. The small bottles with flavours that resulted from this bottling. Another unforeseen “issue” is that for every new batch we get a new SCOBY in each noggin. That is not an issue per se, but starting the last batch we removed more than half of the SCOBYs and placed in a separate jar for storage, and the noggins now allowed for almost another liter of water to be added to the batch… We do want to get rid of the excess SCOBYs, but we also don’t want to just throw them away, so we have an idea that we might just try to sell some of them so that others can start enjoying brewing their own kombucha as well! We do have some other projects to finish before we will start with that however, but it would be a nice way of optimising the yield from our brewing. Time again for spare ribs! It’s so tasty and gives extra value in terms of bone broth. This time we seasoned it with slices of lime and chili flakes. Spare ribs with chili flakes and lime. Placing the spare ribs in the oven at 120 °C for four hours and finishing them off with 30 minutes at 150°C turned out to be a good way of cooking them. The spare ribs after four hours in the oven. As side we steamed some Hokkaido pumpkin, carrots and purple kohlrabi. Served with a piece of feta cheese and a glass of cold kombucha. Spare ribs with steamed vegetables and kombucha. It is definitely a dish that requires some planning, but considering the time spent actually cooking I would not call it slow cooking at all. I spent maybe five minutes preparing the spare ribs for the oven. An other five to decide and chop the vegetables to steam and then twenty minutes steaming the vegetables. So less than half an hour of effort in total. With some planning it might even be possible to reach the Jamie Oliver dinner in 15 minutes ideal, if one is allowed to have the oven on for half a day that is. We have had a lot of lamb lately. It is just such a nice animal and the meat tastes really good. Here is a dinner where we had lamb’s leg. 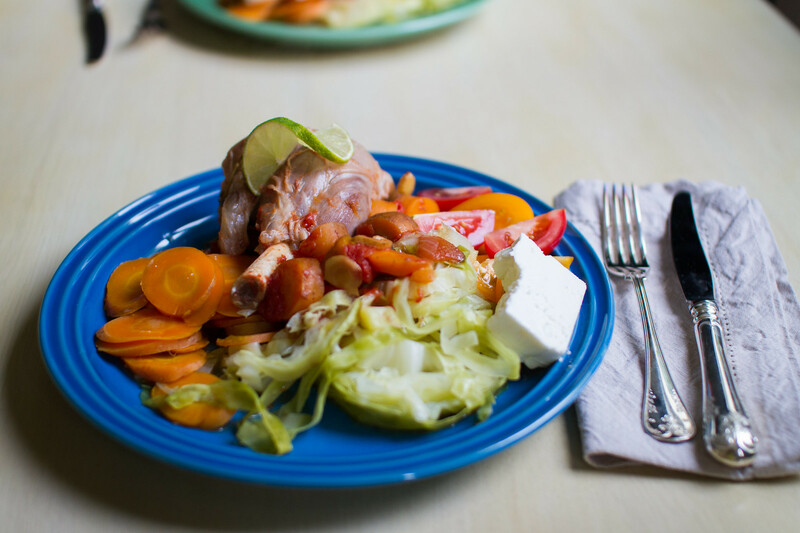 Oven cooked lamb’s leg with steamed vegetables and feta cheese. 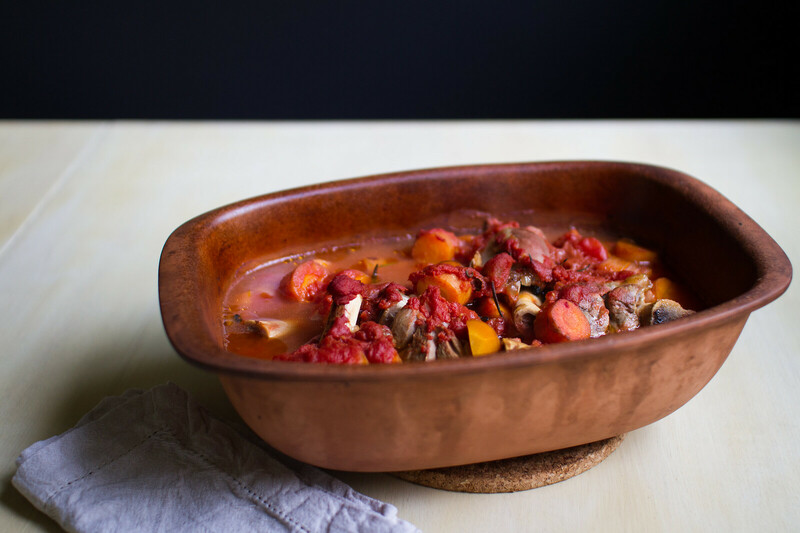 As usual we put it in the Schlemmertopf together with some chopped carrots, rosemary leaves and pepper corns. 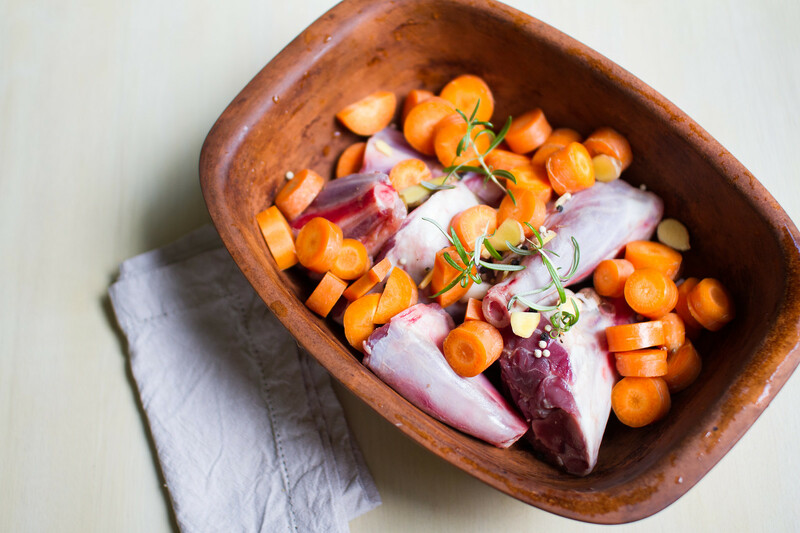 Lamb’s leg with carrots, rosemary and pepper. Before the tomatoes were added. Add some tomatoes and then we put it in the oven for a few hours. As a side we steamed some pointed cabbage and sliced some fresh tomatoes. Served with feta cheese and a glass of kombucha, of course. The final dish. 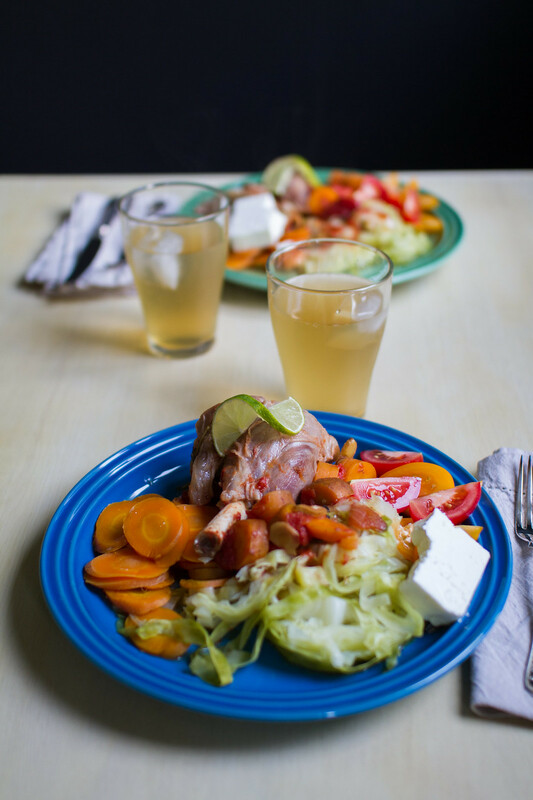 Lamb, carrots, steamed pointed cabbage, feta cheese and a glass of kombucha. Slow cooking at its best! 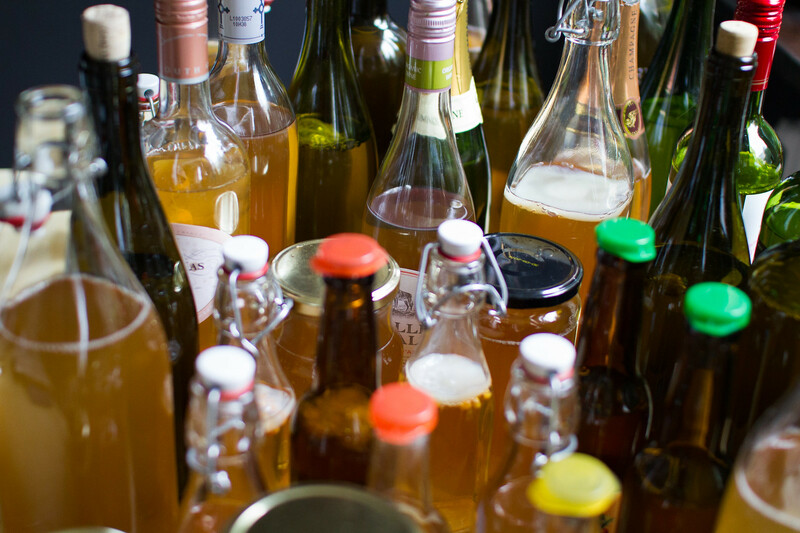 It was time again to bottle the ready fermented batch and prepare a new one. 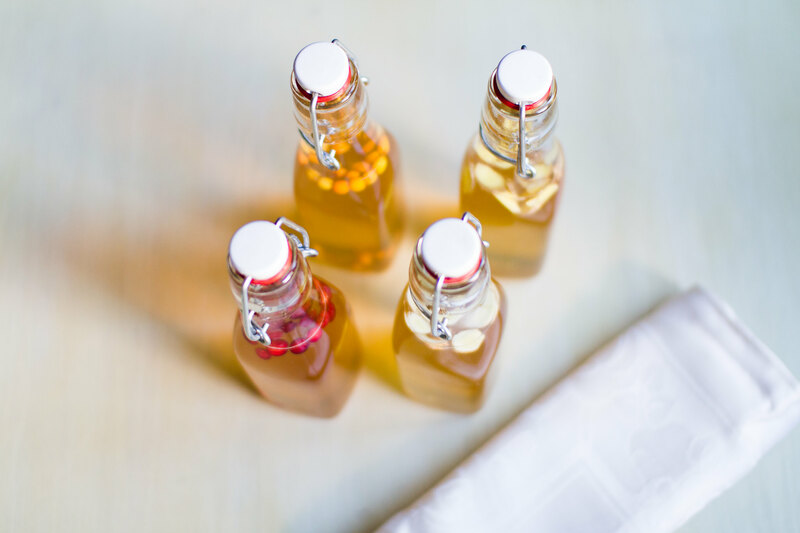 This time we used the now regular flavours, sea buckthorn, lingon berries, mint, rhubarbs and lemon balm. We also try flavouring a large bottle with some ginger. 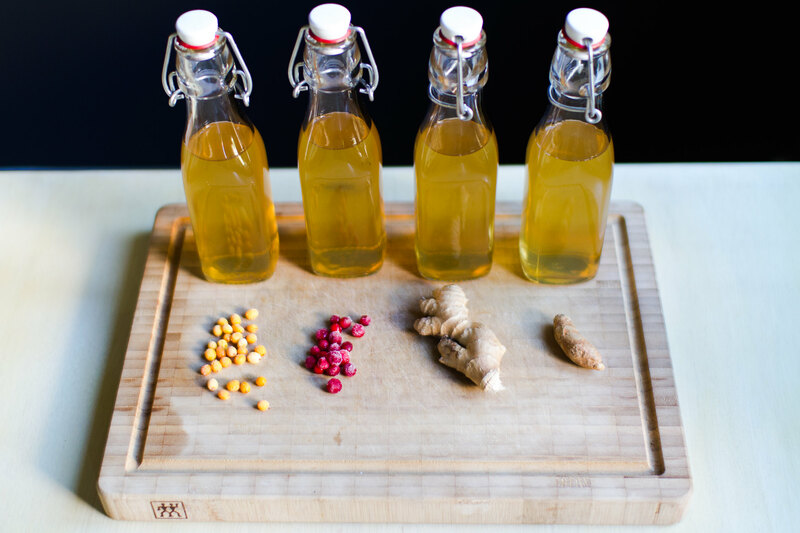 We have forgot to get back to you with our thoughts on the ginger and turmeric flavorings from before (two batches ago?). They both turned out really well. The spiciness is dissolved in the kombucha and there is none of that almost stinging sensation from the ginger left, just a really nice and fresh addition to the kombucha. Same is true for the turmeric, simply a really nice flavour to pair with the kombucha. Our reasons for not having done them again is partly because it took us a long while to taste them and it felt stupid to try an other couple of bottles before we knew if they would taste good. The second reason being that we simply haven’t had the spices fresh at home. But we will try to pick some turmeric up during this week’s grocery run. Large rosé wine bottle with ginger flavoured kombucha. 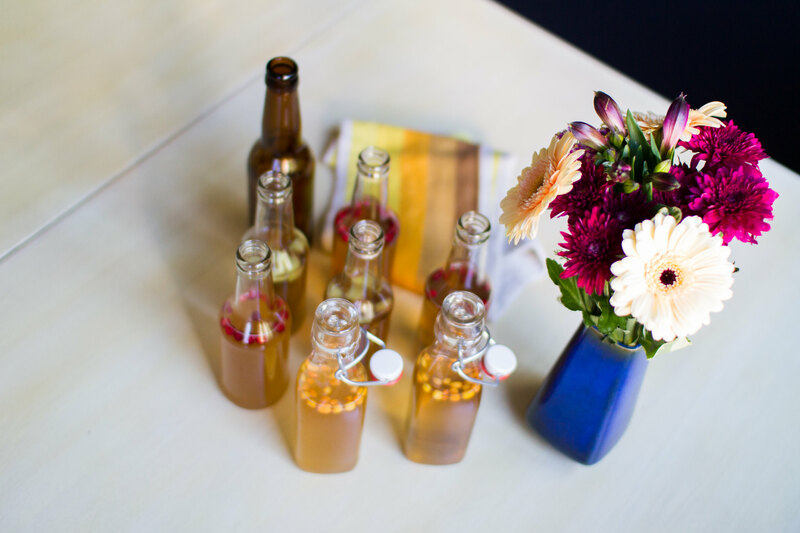 Have a nice week all of you and enjoy some kombucha! 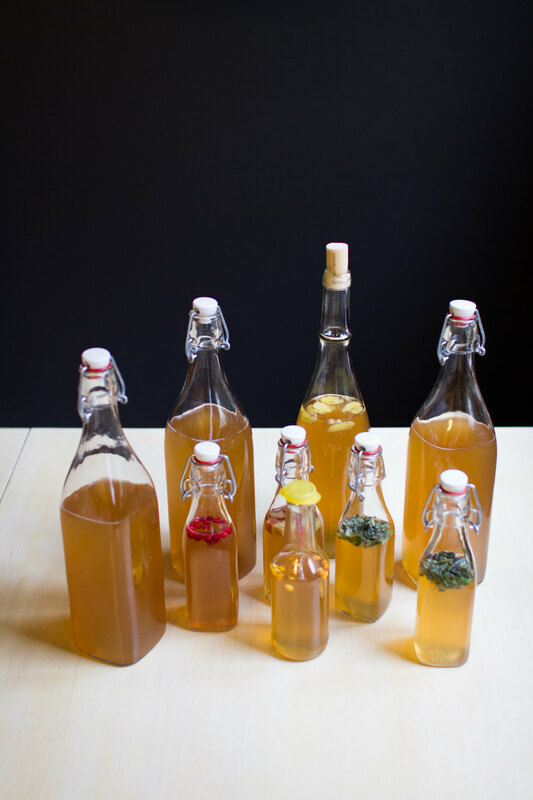 It is time again for bottling a new batch of kombucha. 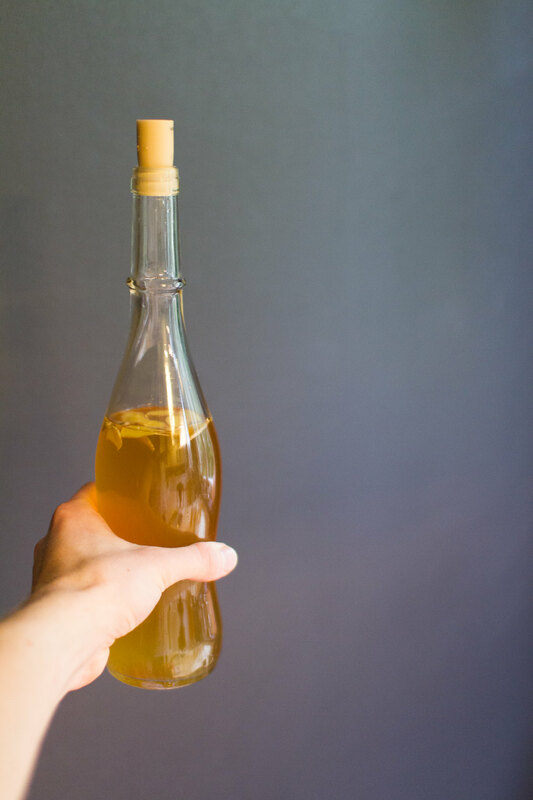 Last week we had a lot going on and bottling the kombucha was unfortunately not one of them, so we had to do that this week instead. So, rather than the prescribed ten days of fermentation this batch stood for about 15 days. It still tastes wonderful, but some of the sparkliness have disappeared sadly. The new batch bottled and ready. It is interesting though to see that it is not a work of precision, but that there are quite some margins and that it is possible to forget to bottle them. The Scobys also looked healthy. It will be interesting to see if there is any change to the next batch, but I don’t expect that. Some flavours again. Mint, sea buckthorn, lingon berries, basil and rhubarbs. The past batches we have had one noggin that has produced very sparkling kombucha, whereas the other has barely had any bubbles at all. I’m guessing that might be due to that the one without bubbles are placed on the kitchen counter, slightly higher up and more exposure to light, compared to the other. For this new batch we will try having both noggins in the cupboard off the floor in the kitchen. We will be back with the results from that. First time we try flavouring one of the large bottles. The flavours for this bottling was largely as the last few ones, but we remembered the rhubarbs in the freezer and also tried with some basil. For the first time we try flavouring one of the large bottles, hopefully it will turn out well. We have now reached the point where the amount of kombucha in each batch starts to get difficult to manage. 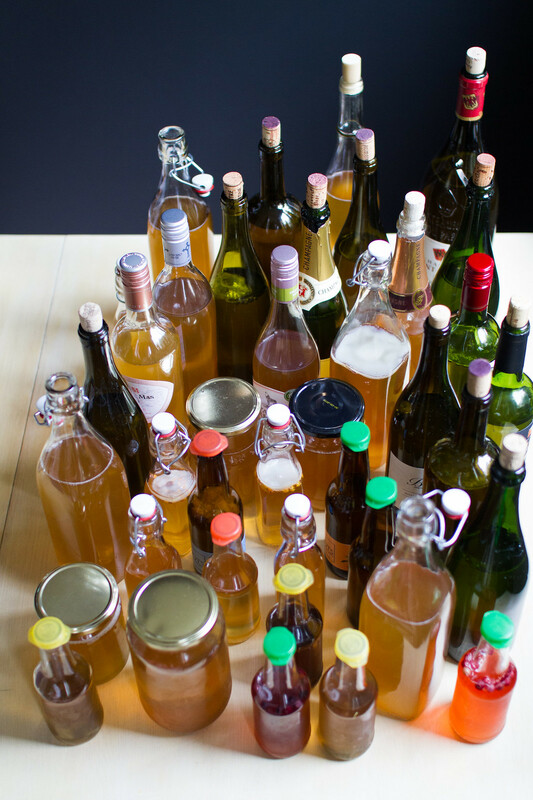 In total we bottled about nine liters this weekend and started brewing a new batch of eight. The flavouring of the new batch. In the last batch we tried three new flavours, namely mint, lemon balm and rhubarb. The rhubarb turned our really well, whereas the mint and lemon balm didn’t really add that much to it all. Rhubarb is definitely one that we will do again, together with the sea buckthorn and lingon berries that have already become favourites. 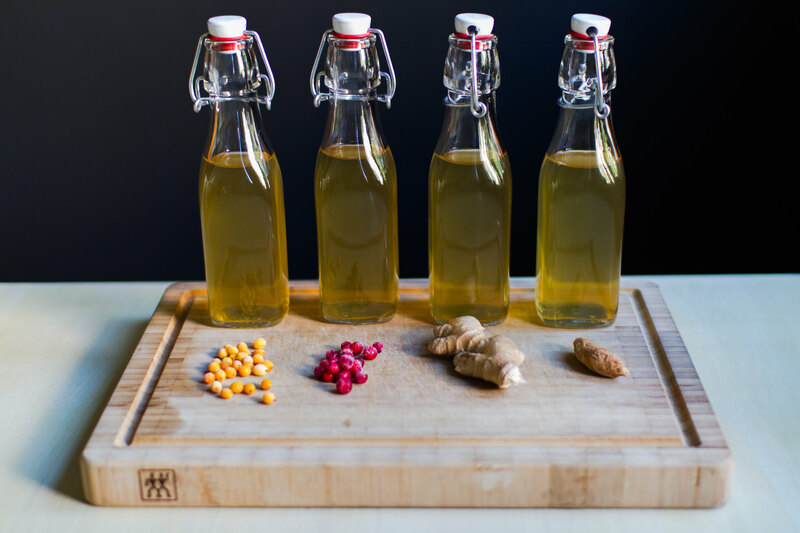 Ginger and turmeric as new flavours and the old favourites lingon berries and sea buckthorn. For this week’s bottling we have got turmeric and ginger as new flavours. 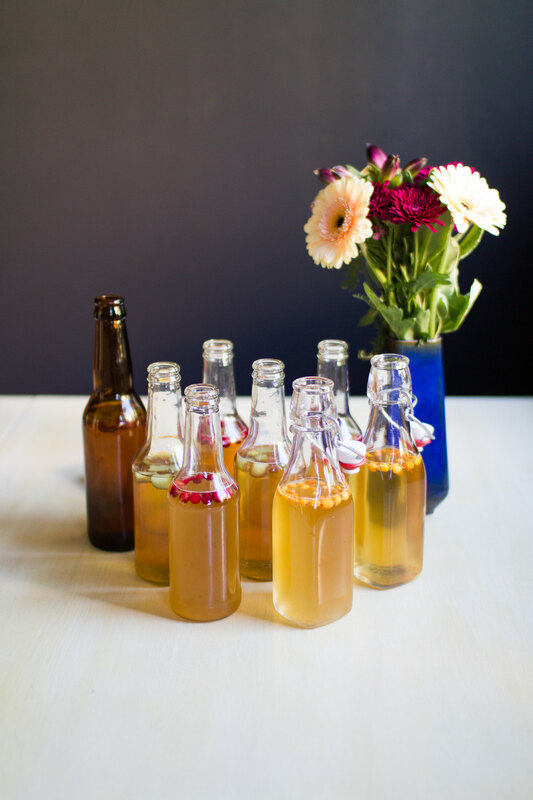 Exciting as these are flavours that we like from the store bought kombucha that we enjoyed before we started brewing our own. The newly bottled kombucha. Some of it at least. We will be back with a review of these as well, when they have passed the second fermentation.